After fifteen months of putting together exquisite photo essays, many of epic length, The Cheshire Cat is taking a short break in order to collect inspiration and material for future blogs. The grinning moggy will return in December with more snapshots and slices of life from our favourite planet. 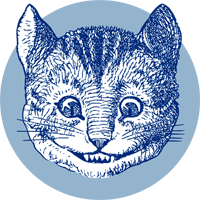 In the meanwhile, take a look of some of our previous Cheshire Cat Blogs. Our feline friend would like to thank those of you who have sent messages of support and appreciation so far, and of course sends purrs of gratitude to his special correspondents Peter Hinze, Gordon Mcleod and Isa Devise. As ever, we welcome contributions of words and pictures to this blog. There is no fixed theme or format, and blogs may be humorous or serious in tone. the My Favourite Planet contribute page. We make absolutely no promises that such puns will not appear on these pages in the future. After all, nobody's purr-fect, are they?